What Should We Memorize Next? 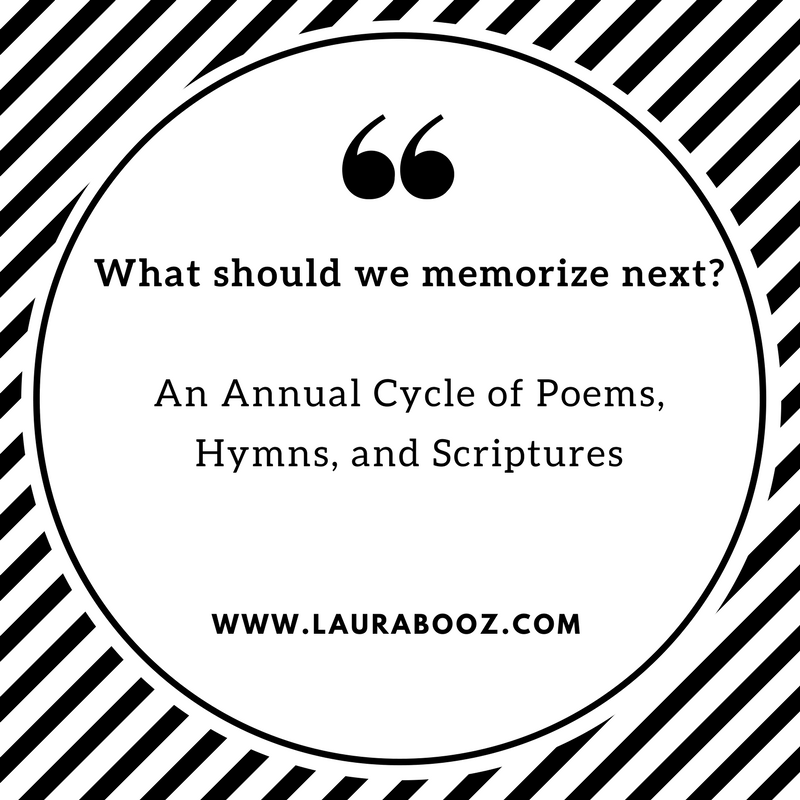 An Annual Cycle of Poems, Hymns, and Scripture. Every day after breakfast, the children and I gather around the table for “Morning Time”. We light a candle and sing the Doxology. Before you get any visions of sublime halos on our little homeschooling heads, let me give you a glimpse of how it really goes. This will pretty much sum it up: my son accidentally lit his hair on fire TWICE. Both times, he was leaning over his morning time binder when smoke began ascending from his head. Although it looked like Pentacost, it didn’t smell like Pentacost. An uproar of blowing, flapping, hooting, wailing, and laughing ensued. Yes, we replaced the banquet candlesticks with a jar candle whose flame is less exposed. Ahem. Also, you should know that when we sing the Doxology, all of the kids stand on their chairs with their arms upraised. I’d love to think that this is their outward display of passionate worship. It is not. They are competing to see who can be the tallest. I am forever mingling my worship of God with fear that one of them will topple over… into the candle, of course. Nonetheless, Morning Time is a blessed time. I love the candle because it reminds us/ me of the Holy Spirit’s presence in our home. I love the Doxology because it reminds us/ me of God’s grandeur over the whole world. 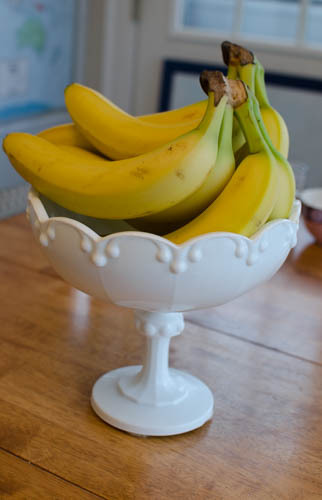 I even love that the children have created their own little traditions around Morning Time because it makes it something bonding, humorous-at-times, and special. play a brain-warm-up-game like Spot It or Memory.All in all, it takes about 25 minutes. My hope is that we’ll cycle through the same series of truth, goodness, and beauty every year so that by the time our children leave our home, they have these pieces firmly established in their hearts and minds. May they become the soundtrack, the mother tongue, the fabric of our family life. Now that it’s April, we are moving on to a new poem, hymn, and passage of Scripture. Last month, we memorized Elizabeth Barrett Browning’s Sonnet 43, sang “Holy Spirit Living Breath of God” and prayed/ read Psalm 23 and The Lord’s Prayer. We’ll review them from time to time this year, but we’ll come back around to spend deep day-after-day time with those beauties next year, and the year after that. This month, we’ll be memorizing Gerard Hopkins’ “The Grandeur of God”, singing “Be Thou My Vision” and memorizing Romans 12 with its convicting and inspiring description of the Christian life. Enjoy this variety of pieces that build the human soul for life’s various trials and triumphs. These gems are also well-respected place in literary and/ or Church history. All you have to do is download and print these beautiful PDF’s (designed by my friend, Ashley Munn). Select one piece from each path. Simply read or sing a portion or the whole of that piece every day for a month. Submit your name and email below and I'll send these pdf's to your inbox, pronto!